The Kansa Wand is an unique, exquisite & effective massage tool hand-crafted in India and works great in giving you a younger looking face, relieving from stress and pain, and rejuvenating your mind-body. Whether you use it as a part of a facial or a full body massage experience, this wand is sure to give your face a relaxing, revitalizing and gentle experience. And that is how the Kansa wand became to be known as one of the ultimate healing tools used in Ayurvedic practices. Continue reading this Kansa Wand guide to learn more about design, how-to-use, benefits of various types of Kansa wands. Kansa wand is made with the healing metal of India known as Kansa and is all natural involving no electronic gadgets, harmful radiations or chemicals. The metal used in Kansa is an alloy of tin and copper, known as bronze. Kansa or bronze metal, revolutionized the ancient practices in several ways. 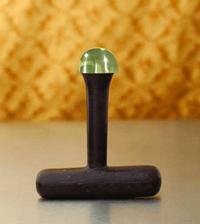 Kansa Wand, made with Kansa metal, is very light to hold and easy to work on the face. It is easy to carry around and travel-friendly. The Kansa wand is designed to move deep into and underneath the contours of the face and around areas where that hold the most tension like the browline, the jawline etc. When using Kansa Wand, as a face massage tool, introduce it from the head holding the wand like a pencil and gently massage with clockwise circular motion on the forehead. To reduce fine lines on forehead, use eraser motion to vertically slide Kansa wand up and down on forehead. Massage your cheeks gently as you glide down and firmly as you glide it in upward direction. The Ayurveda Kansa wand is specifically designed to massage Marmas, the vital points in the body, such as veins, muscles, joints, or ligaments, where the life force energy is concentrated. Some of the vital marmas on the face are the hollow of the temple, around the eye socket, right in front of the ear, middle of the cheek. Marmas, when activated by touch or massage, provide deepest level of healing, specifically calming to nervous system and easing muscle tension. Step#1: The first step is to apply oil, about 2 to 3 pumps of it to, your hands and put a very small amount of it on your face, and be sure there is a layer all around. Step#2: Start massaging the Kansa Wand in circles in the middle of the forehead, as well as doing a zigzagging massage in the shape of the number '8'. Step#3: Then go to the eyebrow areas and start massaging it back and forth around that area and around the left and right temple. Step#4: Move to areas around eyes and start massaging counterclockwise and clockwise around the eyes and the cheekbones. Step#5: Then go from the cheekbones to the ears and start massaging the area around your ears, and then keep massaging in circles around your earlobes, then moving back to your cheekbones, then your nostril, and jaw bones, and keep moving it back and forth across your face massaging it in circular motions. You can also use the Kansa Wand on different parts of your body such as your feet and legs, and the more you use it, the easier it will become. You may be wondering...Does Kansa Wand really work? Is Kansa Wand a Hoax? Kansa Wand is not a hoax or scam and it absolutely works. Whether as a part of a facial or a stand-alone experience, Kansa wand gives a natural, gentle face-tightening and revitalizing experience that you may not get using other tools or therapies. Continue reading this Kansa Wand review to learn about Kansa Wand benefits and how & why it works. What are the Benefits of Kansa Wand? history to reduce stress, increase energy, and enhance health and personal well-being. The facial massage was practiced until 19th century to counter the signs of aging such as wrinkles, dark circles and fine lines. Due to its healing properties, Kansa Wand massage offers many such advantages for your face and body: legs, arms, head, neck, back, stomach, chest, etc. which helps to improve blood circulation and relax the area. You can also use Kansa wand to get relief and relaxation for stiff shoulders or painful backs. Massaging the face with the wand revitalizes face by gently lifting your facial skin, increasing blood circulation and reducing the face pain and swelling. The oxygen produced from increased circulation helps detoxify skin by releasing toxins and make it look brighter and naturally fresh. It's a great complement to the other facial massage therapies and anti-aging treatments used reducing fine lines and wrinkles. Kansa Wand also reduces pain and tension in shoulder and neck muscles. It offers a sensation that calms the nervous system and eases muscle tension, helping to relax the whole body and calm the mind. It also makes it easier to fall into a deep and relaxing sleep. Kansa Wand is a great tool to reduce acidity by detoxifying and relax your body, mind and spirit. Some may observe a temporary greying effect on the skin by using the Kansa Wand. This is primarily because of the acidity in your body that is drawn from your skin by Kansa Wand. Acidity in your body reacts with the Kansa metal causing the temporary greyness on the skin. The graying effect is good. You are detoxifying your skin and reducing acidity in your body, helping towards your goal of improving health and wellness. When this graying effect occurs, just gently wipe the area of skin using a soft tissue and a gentle soap. Putting a lot of care into your body you would think would take a lot of time. However, when you use the Kansa Wand, the time that it takes to give yourself a facelift is less than 20 minutes and this is one reason alone that the Kansa Wand is so appealing. People are busy and cannot afford to put a lot of time into self-care nowadays while they are busy caring for their families, their homes, and work! That means you will get a facelift in less than 20 minutes, so it is instantaneous! You cannot go wrong with that at all! Since it only takes 20 minutes to nourish your body with the Kansa Wand, you will never have a reason to put off giving yourself the proper self-care you need again! Not only is using the Kansa Wand a great way to save time but it also is so easy to use. Many tools that people are offered whenever it comes to helping them care for their bodies are not always user-friendly. 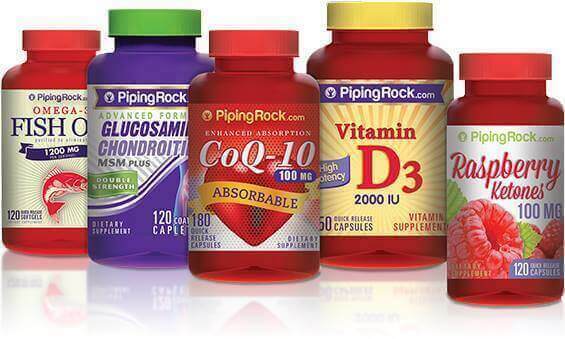 Examples of that would be having to take too many steps to use a certain product to reap the benefits. However, that is not the case with the Kansa Wand. This instrument is made of wood and it is known to be the finest healing metal around! There are no accessories, attachments, batteries, or anything else needed to use this amazing instrument. This is all you need to use in order to give yourself the best gift ever, which is the gift of nourishment and self-care! You are already well aware how this fantastic instrument can provide amazing healing within the physical body and in the mind. Well, it also helps bring both healing energies together which provides the balance which is called the tri-dosha balance. They are the three bio-energetic principles that have been known throughout Ayurveda history which are called Kapha, Vata, and Pitta. The tri-dosha balance will provide you with so much harmony within the body which will only provide you the peace, the health, and the balance that your body is designed to have. This way, you no longer have to face cluttered energies within due to living in a fast-paced society where you are always in a rush, under stress, and as a result, you have been facing poor health. The Kansa Wand will once and for all provide you with the energy balance that you have always been meant to have and that will bring you back to being in excellent physical, mental, emotional, and spiritual health. Kansa Wand is a great Ayurvedic choice over various modern wands in the market, such as Dermawand. Derma wand uses stimulation technology with high radio frequencies and thermal energy, which may have some potential side effects such as redness, sensitivity, peeling or dry skin. But with Kansa Wand, there’s nothing to get worried about because the wand is working towards giving you a natural, safe and effective face-tightening and revitalizing experience. Plus, you don't need any electrical wires or batteries. Periodic cleaning of Kansa Wand is necessary to maintain its hygiene, energy and longevity. Kansa is a sensitive metal due to its unique electrical-conductivity characteristics, hence it should be cleaned periodically and maintained with care. You can clean your Kansa Wand with a chemical free and non-abrasive soap to ensure that there is no oil residue left on the metal. You can also use a mixture of tea tree oil and sterilized organic clay to clean your wand. To prepare this mixture, make a paste of organic clay, a drop of tea tree oil and warm water, apply to the Kansa metal surface, wipe it clean with a damp cloth. Avoid using hot water or any soap or chemical that could be harsh on the metal. Do not scrub the Kansa metal surface with anything harsh or abrasive. You can also purchase a Kansa Wand Maintenance Kit from The Ayurveda Experience for $15. It contains Kansa Wand maintenance clay, Kansa Wand maintenance oil and a cleansing cloth to make the process simple and easy. Step 1: The first thing to do is take the Kansa Wand Maintenance Clay, and take one teaspoon of it and put it in the bowl. Step 2: Pour some water into the bowl to make it thinner and make sure the paste is thin enough so you can use it. Step 3: Once the desired consistency is achieved, then put some of the paste onto the wand's metal bowl, and be sure to take the maintenance cloth out that you had received in the kit. Step 4: Take one corner of the maintenance cloth to put into the paste in the bowl, and start rubbing it on the wand to clean it up and to keep it well-maintained. Step 5: be sure to clean the entire wand up with the paste and keep rubbing it until you are happy with how well it is cleaned off. Step 6: Take the other corner of the cloth and wet it, and use it to wipe the paste off completely. Step 7: Now that the wand is clean, you will need to take another step to properly maintain it by taking one drop of Maintenance Oil and apply it on the wand's surface. Step 8: Take the next corner of the cloth and be sure to rub the oil around the wand as well as you can- and here is a word of caution that you need to be aware of. This oil is composed of Tea Tree Essential oil which is not meant to be in contact with your skin so be careful not to touch it. Step 9: Then take the last corner of the cloth and wipe the wand very well so that there is no risk of you touching the oil, and be sure to do this on a regular basis. The more you keep your Kansa Wand properly cleaned and maintained, then it will serve you well and effectively for that much longer! And, with that said, you are also going to want to know what oils can be used with the Kansa Wand. Which Oils Can Be Used With The Kansa Wand? Since you already know about what oil to use when it comes to cleaning the Kansa Wand, you will want to know what oils work best while you are using the wand otherwise. If you want to use the wand for your face, then the best oil to get would be the iYURA Kesaradi™ Oil. It contains Ayurvedic herbs such as saffron and turmeric that provide so many nourishing benefits to your facial skin, and your face will feel amazing after using this oil. Alternatively, if you prefer to use a vegan oil for your face and body, you will want to purchase the iYURA Kansa Oil™ and it has so many healing Ayurvedic herbs as well such as vetiver grass and licorice. These herbs are amazing when it comes to nourishing your skin, hydrating it, and improving its health. 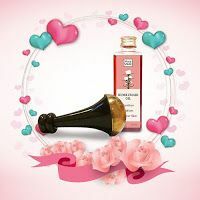 And, if you plan to use the Kansa Wand on your feet, then you will want to get the iYURA Himaruti oil™. The iYURA Himaruti oil™ has some powerful Ayurvedic ingredients that will help nourish and soften your feet such as Indian Madder and beeswax. However, if you plan to use other oils that are perfect for your skin type, you can also use jojoba or coconut oil. Just be sure that these oils come from a high-quality health store or outlet. Either way, the Kansa Wand used with the right oils for the purpose of its use and is maintained and cleaned regularly, you will absolutely love the benefits that you will be reaping. The Kansa Wand tool is effective in giving you a younger looking face, relieving from pain and stress, and rejuvenating whole mind-body. 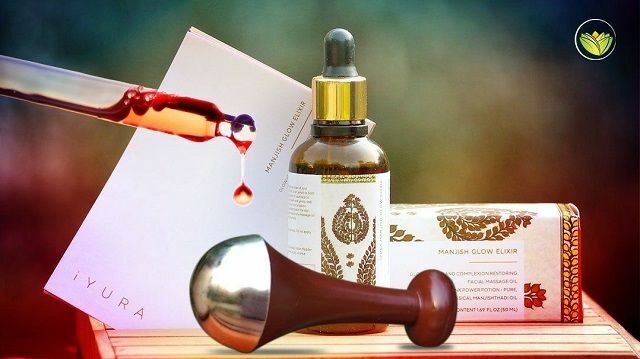 Due to it's stress-relieving, skin-nourishing and mind-body-rejuvenating benefits, the ayurvedic Kansa Wand has many received positive reviews and acclaim from its customers across the globe. The Ayurveda experience offers a complementary oil when you buy a Kansa wand. Although you may be able to purchase Kansa Wand from Amazon as well, you will not receive a free bottle of Kesaradi, Kumkumadi or Kansa oil offered on The Ayurveda Experience website. Now is the time to learn about the Kansa Wand Set, and here is an opportunity to learn about it! When you buy Kansa wand at The Ayurveda Experience, you will receive a complimentary bottle of Kesaradi Oil (read Kesaradi oil review), Kumkumadi Oil (read Kumkumadi oil review) or Kansa oil (read Kansa oil review) with your purchase. Although you may be able to purchase Kansa Wand from Amazon as well, you will not receive these oils as complimentary on Amazon. 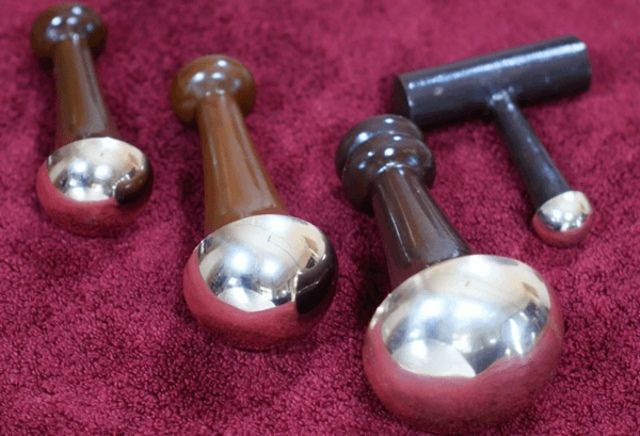 In order to reap the benefits of a full face massage, the personal Kansa face wand is the tool to use. Throughout Ayurveda history, Kansa, or metal without any type of radiation or chemicals has been used in India for thousands of years for healing. The face wand has a smooth surface on its dome so the massage that you are going to be giving your face will be gentle and will feel amazing. The dome is small and it allows you to target smaller areas of your face that you want to be massaged so it is not only effective but it is precise. This wand is designed the way it is in order to provide you with all of the sweet benefits that you can get by giving your face a gentle, smooth, but effective face massage. There are many areas on your face that you can easily miss if you were to try to massage your face with your fingers or with another tool. However, with the personal Kansa face wand, you can reach all areas of your face with this tool so that every part will get the massage that it needs so you can enjoy it fully. Not to mention, with this wand, the handle is smaller and lighter than it would be with the other ones because it is specifically for the face, and it is made with high-quality wood that is very durable. Now, let's talk about the medium Kansa face and body wand. The medium Kansa face and body wand is multifunctional purpose wand with unique dome designed to be used for different areas of the face and the body. This wand has its dome similar to the one on the personal face wand. However, it is higher than the wand for the foot which will be discussed in just a moment. And the reason the dome is overall higher is that it allows you to target areas of your body that are quite specific. Not to mention, the handle is lighter and is extremely user-friendly so it is simple to target specific areas of your body wherever they are so the massage from the wand can be quite effective. You can use this wand stroke desired areas of your body in a circular or back and forth motion. Whatever you prefer and both ways are correct. Everyone is different as far as the massaging preferences for how they want the wand to be used. The massage by this wand is also very comforting, soothing, and effective to help you feel great. The handle is made of high-quality and long-lasting wood. And, you will need to get the benefits from the Kansa wand for your feet as well, but this wand is not meant to be used for your feet. The large Kansa foot wand is, and let's now discuss that further. The Large Kansa Foot wand is made using is Kansa metal ideal for bringing comfort for foot. This is how the Kansa foot wand that is used nowadays came about. The Kansa foot wand is purposely large, has a dome that is very wide and has an open shape. It is designed that way because it can easily work with the entire foot contours whereas the other Kansa wands that are specifically meant for the face, or the face and body cannot. This wand makes the energy of the foot easily accessible due to its unique design. What that means is that you do not have to worry about straining your hands by having to press hard. Kansa foot wand has perfect weight ensuring the most impact on the foot, so you do not need to press and strain yourself by forcing extra weight in order for your feet to have the soothing and healing benefits of the wand. The dome's surface is smooth, soft, durable and uniform with a handle that allows you to hold the wand in any way that is the most comfortable for you. The handle is shaped in a way where you can use it in the best way for you so you never have to worry about straining any other part of your body. The purpose of the Kansa wand, in general, is to bring your body comfort and provide it the energetic balance it needs. And, this is why the foot Kansa wand is specifically meant to massage and provide energetic healing for your feet. The wood on the handle is also quite high-quality like it is for the others. And, the set would not be complete if it there was not a Marma tool in it as well. Let's go over that one briefly. The Kansa wand would not be useful if it did not target the Marma points in different parts of the body, and this is why there are three different Kansa wands designed for several uses depending on the area of your body that needs energetic healing and balance. And, throughout Ayurveda history, the Marma points which are the energy points were found by practitioners and they were able to provide energetic healing through their own metal Marma tools, and this is exactly what this important component of the Kansa Wand Set is used for - which is the Marma tool. The Marma tool is there to address to heal and address the Marma points in the body, as well as providing benefits that any kind of reflexology session could provide you. With that said, the Marma tool is an excellent instrument to use for reflexology. That is why this tool includes a small dome so specific areas can be targeted properly by this tool in order to get the benefits from the massage that you can give yourself by using the Marma tool. The Marma tool is designed to provide you the pressure you need in order for it to be effective. It will also unlock energy to help you find optimum balance and harmony throughout your body. This is why the entire Kansa set would not be complete if it did not include this tool. The other Kansa wands, again have their own individual purposes which do not have the ability to target specific Marma points due to the fact that they are designed only to work with other parts of your body. This tool, however, is meant for this purpose, and the handle of the Marma tool has been created specifically for being able to hold it with ease so it can be easily worked with the energy in subtle and in light ways while it applies the pressure that is necessary for it to be effective. And, just like the other tools in this set, the handle is also made of wood that is extremely durable and of excellent quality. The best gift you can give yourself is the Kansa wand set. Ayurvedic practitioners in India have been using Kansa Wands for thousands of years. Kansa wands bring you all the energetic benefits you can get by balancing and healing your energy within your body in a harmonious way. This Kansa wand set comes with three Kansa wands that are designed to provide you with the energetic healing to specific areas of your body. In addition to that, the set would not be complete with the Marma tool, which provides a unique benefit by being able to unlock energy from your Marma points in specific areas of your body. Once you use these tools in this set for a while, you will start feeling quite balanced physically, emotionally, spiritually, and energetically. You may also want to learn about another option as well that is offered by The Ayurveda Experience...The All-Things Kansa Set! Let's now take a good and thorough look at what is included in the All-Things Kansa Set. You can get everything that the Kansa Set offers all in one shot if you purchase this entire set. 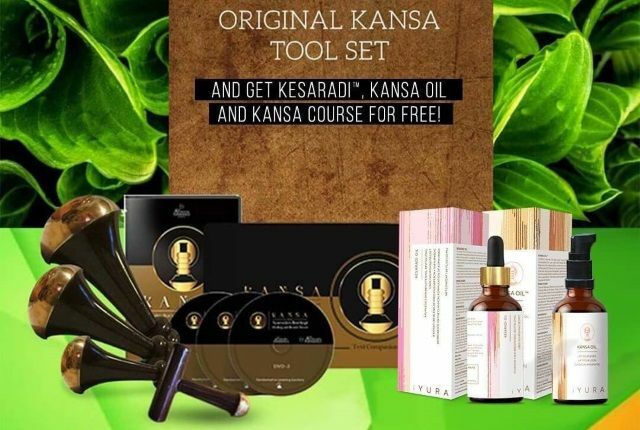 In fact, the benefits would be incredible if you did because you will be receiving 4 Original Kansa Wands, as well as a FREE iYURA Kesaradi™ Face Oil, and a FREE iYURA Kansa Oil™ for Face & Body. Included in this package is also the FREE Kansa Course that you will want to take in order to make the most of these tools that this set includes. You already know about how healing and balancing the 4 Original Kansa Wands since the metal or Kansa wands have been used among Ayurvedic practitioners to massage their patients in order to help remove stress and tension and to help them become energetically balanced within. And, the iYURA Kesaradi™ Face Oil that is included in this set will provide you the nourishing, hydration, and the revitalization that your facial skin needs, which includes a healthy and glowing complexion. The FREE iYURA Kansa Oil™ for Face & Body does the same for your skin on your body and it provides other benefits such as bringing your skin the comfort it needs. Not to mention, these oils will provide you with the skin, mind, and body rejuvenation, stress and tension relief you need so you are properly balanced within. And, the FREE Kansa Course will teach how you reap all of the benefits! Let's talk about the 4 Original Kansa Wands briefly again so you know why you need to use these tools in your life. In Ayurvedic history, metal massages were used by practitioners to help relieve tension, stress, and provide harmony, balance, and peace within. This way, the patients would become energetically balanced spiritually, emotionally, mentally and physically. And this is why these metal or Kansa wands are important tools in order to help people achieve that. That said, the All-Things Kansa Set includes the 4 Kansa wands that have been discussed previously. Included in this set is the small personal Kansa face wand which is designed to massage all areas of the face, no matter how small they are in order to provide the energetic healing it needs. And, the other wand included is the medium Kansa face and body wand and which is designed to provide the massages to general areas on the face and the body so the entire body receives these energetic and healing benefits. The large Kansa foot wand is created in a way where it provides the proper weight to have an impact on the feet energetically while the wand is easy to use. And, the Marma tool cannot be forgotten as this instrument is designed to unlock energy from the Marma points in your body in order for you to reap the energetic benefits. And, you already know that special oils must be used while using any of the Kansa wands to massage your body. Now let's talk briefly about one of the oils included in this set which is the iYURA Kesaradi™ Face Oil. The All-Things Kansa Set would not be complete if it did not include the important Ayurvedic oils such as the iYURA Kesaradi™ Face Oil. 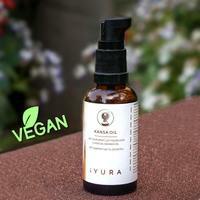 And, the iYURA Kesaradi™ Face Oil is there to brighten, smooth, and moisturize your skin. It is also meant to help improve the texture of your complexion and give your face the luminous complexion you have been wanting for a long time. 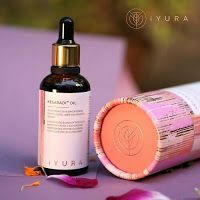 The iYURA Kesaradi™ Face Oil is composed of Ayurvedic herbs such as saffron, sesame seed oil, turmeric, and Indian Madder that have incredible skin nourishing and healing properties. Practitioners throughout Ayurveda history used these healing herbs to not only help with healing many skin conditions in addition to other conditions, but they would create formulations of these healing herbs to create a powerful healing mixture that would have a strong impact on patients. And this is how the iYURA Kesaradi™ Face Oil came about as it has these healing herbs and people who have used it have absolutely found this one to be the organic and natural product that had finally given them the complexion they have always wanted. This formulation does not have any additives or chemicals and is cruelty-free. You can maximize the benefits by using this oil to use for your face when you are massaging it with the small personal Kansa face wand. Not to mention, it is so easy to use as all you need to do is put a little on your face and start using the wand to rub it in and massage it. And, this set would not be complete if it did not come with the iYURA Kansa Oil™ for Face & Body as well, so let's discuss that further. The iYURA Kansa Oil™ is meant to be used with the Kansa wand, especially with the medium Kansa face and body wand. The Kansa oil is composed of Ayurvedic ingredients that have been used among practitioners throughout Ayurveda to heal plenty of skin ailments, as well as plenty of other ailments that have a negative impact on the energetic balance within anyone's body. Some of the specific healing Ayurvedic herbs that are part of the formulation of the Kansa oil are sage, Indian rose chestnut, vetiver grass, sesame oil, Indian Madder, licorice root, Indian Blue Water Lily, and Beautyberry. These herbs have been used to not only heal skin conditions, but have powerful antioxidant and antibacterial, antifungal, and antiviral properties to not only help heal skin tissue but prevent infections from happening as well. And, the bonus is that this oil contains natural antidepressant properties and will help you feel incredible inside and out! Using the Kansa oil is so easy as all you need to do is to cleanse your face, and then to spray the toner of your choice on your face before applying the oil on it. Then take 3 to 8 drops of the Kansa oil into your hand, and then use the appropriate wand to dip into it and start massaging your face and/or body in a circular, zigzagging, and stroking motions. I am sure will absolutely love how the Kansa oil will illuminate and rejuvenate your body when you use the right Kansa wand to massage it in! However, you need to take The Kansa Course in order to reap all of the benefits that you can get by using all of the tools in this set. This is why The Kansa Course: Ayurveda's Best Kept Healing and Beauty Secret has been offer into this set for free! ● The Ayurvedic bodywork 4 goals and what exactly makes people happy, healthy, energetic, and inspired. ● Kansa history and how it works. ● An introduction to the Marma points, the benefits of the Marma massage, and how to unlock energy from these points. ● A thorough demonstration of the small personal Kansa face wand, the large Kansa foot wand, the medium Kansa face and body wand, and the Marma tool. ● How to care for these tools, and how to clean and maintain them. ● The graying effect and what it shows you. This course also includes a bonus section which is a demonstration of a unique protocol that is used for relieving anxiety. This course will teach you as well how to utilize ancient Ayurvedic practices to relieve stress, increase your strength and energy, improve your health drastically, as well as how you can support your well-being and longevity. And if you practice these techniques that are taught in this course every day, you will be on your way to better health. Additionally, you will be leaning a lot about how toxic the environment can be and how to prevent yourself from being affected by the toxicity of the environment. In fact, anyone who wants to live a much better and healthier lifestyle will greatly benefit from taking The Kansa Course: Ayurveda's Best Kept Healing and Beauty Secret even if you don't have the Kansa wands and oils. That is because you will learn everything about living a holistic, peaceful, balanced, and healthy life you meant to live. The problem is that due to pollution, toxicity in the environment which includes the foods we eat, as well as the stress we face due to living in a fast-paced society is that we have forgotten how to live a balanced and holistic life. But, The Kansa Course: Ayurveda's Best Kept Healing and Beauty Secret teaches you how to start living that way again, and this is why this course is being thrown into the All-Things Kansa Set for free! In order to experience all of the benefits of living a purely holistic and natural life, the life you were intended to live since you were born, you can do so when you invest in the All-Things Kansa Set, which also means you will be investing in yourself! You will receive all of the necessary tools to live a balanced, healthy, and happy life by receiving the 4 Kansa wands which include the one for the face, the one for the face and the body, and the one for the feet. Additionally, you will receive a Marma tool as well in order to unlock the key energy points from the Marma points so you can really reap the benefits of creating an energetic balance physically, emotionally, mentally, and spiritually within. Not to mention, you will have 2 types of special Ayurvedic oils, Kesaradi Oil and Kansa Oil, that provide many healing benefits for the skin and your overall well being. And, you have a free course in there that will teach you how to not only use these Ayurvedic tools but it will teach you how to live the most balanced and healthy life that you were meant to live, because you are worth it!